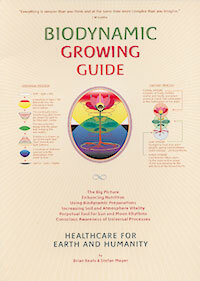 Biodynamics is enjoying world-wide growth. There is an increasing awareness in the community of food quality and production methods. Those who have heard of biodynamics associate it correctly with high quality, non-chemical, organically grown and flavorsome top-of-the-range produce. However, what is biodynamics really? What lies behind it? The Biodynamic Growing Guide , produced by Brian Keats, sets out to give a succinct "big picture" of this restorative path of agriculture that will help take us into the future. Every word, color and form in this Guide is important. The guide has been designed to be used. A regular application and contemplation of the guide will help bring about a reconnection to the rhythms of nature and wonderment and joy for the mysteries of the world. We invite you to order using our secure server. Price per copy, exclusive of shipping and sales tax (for Pennsylvania residents), is $18.95. To order calendars, please go to our order page. Quantity wholesale pricing available, please contact us.